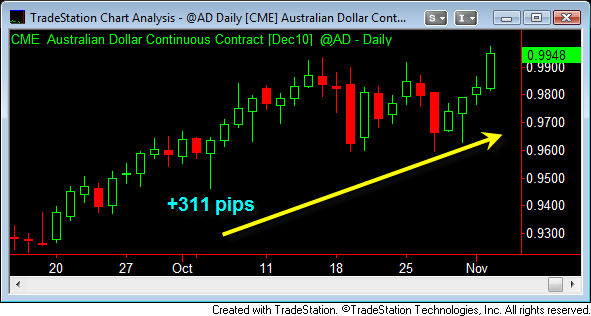 Australian Dollar is set for ACD Method trading. The market was expecting the Reserve Bank of Australian (RBA) to raise interest rates 0.25% from 4.50% to 4.75%. 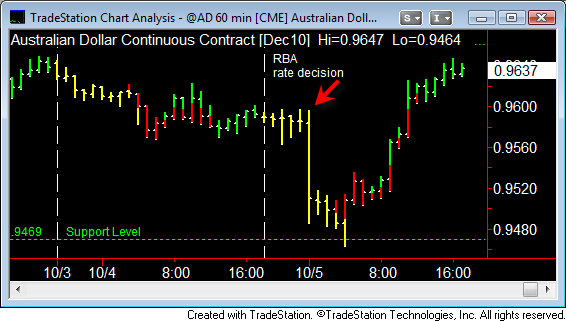 RBA surprise the market with a decision to leave their rate unchanged. The Australian Dollar dropped immediately. It dropped 128 pips during the Asian/European trading session. It made a bottom and reverse back up. The selling pressure did not even last one full session. The Australian Dollar made a V-Shaped intraday reversal. Price continued to climb back and recovered all of its overnight loss. It became so bullish that it closed the day 45 pips higher than the previous day's close. This sets up ACD Method for trading "Bad News/Good Actions". We had "Bad News" and the market reacted negatively. However, the price action was "Good Actions". This tells us to be in Bullish Bias mode for the Australian Dollar. We also know the ACD point of "I know this is where I am wrong" is at 0.9469. Australian Dollar should not drop back up to 0.9469 if it is to continue heading higher. I would look for signs of A-Up to prove that the bullish bias is still in progress. My last month's ACD setup proves to be correct. The Australian Dollar has gone up more than 311 pips. The Reserve Bank of Australian (RBA) caved in to economic pressure and raised interest rates 0.25% from 4.50% to 4.75%. The Australian Dollar rallied to a new high. Bullish Bias is maintained.